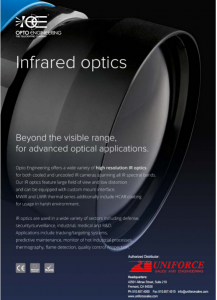 Long-Wave Infrared Lenses, LWIR series, is a range of long-wave infrared lenses specifically designed to operate in the 8-14 ?m wavelenght region with uncooled detectors (a-Si, VOx,..). In the design of the lenses great importance was assigned to high image quality and large aperture (small F/#). These lenses can also be equipped with custom mount interfaces. These lenses, mounted on an uncooled LWIR camera are the perfect choice for a variety of applications spanning from industrial to military, including temperature measurement for process quality control and monitoring, predictive maintenance, imaging through smoke and fog, medical imaging. Designed for high resolution detectors up to 15 ?m pixel pitch and 21 mm diameter. Opto Engineering MWIR and LWIR thermal lenses are HCAR coated These thermal lenses are specifically designed to meet the needs of those applications with optical elements exposed to harsh environments, such as military vehicles and outdoor thermal cameras. This coating offers highly protective properties coupled with good anti-reflective performance, protecting the outer optical surfaces from high velocity airborne particles, seawater, engine fuel and oils, high humidity, improper handling, etc.. It offers great resistance to abrasion, salts, acids, alkalis, and oil. 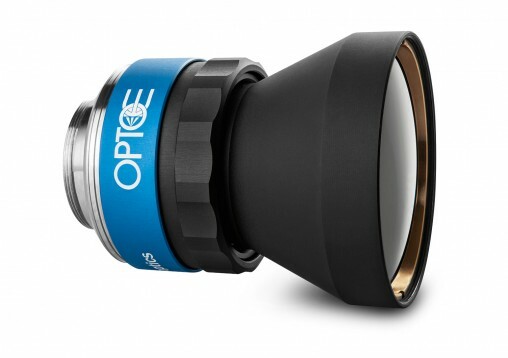 Opto Engineering infrared lenses are designed for high resolution detectors up to 15 ?m pixel pitch and 21 mm diameter. Common infrared lenses are designed and optimized for Focal plane arrays (FPAs) with 30 ?m pixel pitch. However, as a trend, pixels are constantly decreasing their size: Opto Engineering IR lenses are compatible with the newest high resolution FPAs. Since no standardized and/or appropriate quality measurement system is available, Opto Engineering designed and developed a specific optical test bench for Infrared (IR) optics. The system design is based on Opto Engineering proprietary design optical benches used in the visible range. Opto Engineering developed reliable test procedures for checking IR optics quality and resolution (MTF: Modulation Transfer Function): each lens is checked by an experienced operator. Opto Engineering R&D team has proven expertise in designing challenging and demanding custom projects that successfully integrate optics and their mechanical housing. Upon request, Our engineering team can develop both active and passive athermalized systems, either optically or mechanically compensated, that work in environments characterised by significant temperature changes.